Na Magha and Coleraine must try again after they could not be separated in Sunday's Leadon Timberframe Derry Junior Championship final thanks to Deaghlan Foley's injury time free which capped an excellent second half fightback from the Derry City side. The replay is set for Wednesday, October 10th back at Owenbeg when Na Magha will be boosted by the return of Alan Grant who was suspended from Sunday's game. Grant's return will be a huge boost for the city men but most of the pre-match chat in the build-up centred on the Coleraine line-up. With the football Championship Quarter-final replay on Wednesday (and a possible semi-final on the Sunday after should they upset Slaughtneil), the accepted wisdom was that Eoghan Rua would not be fielding their dual quota but it proved inaccurate. Colm, Sean Leo, Barry, Ciaran and Liam McGoldrick all started, as did Niall Holly in a strong Coleraine line-up that ensured there would be no repeat of last year's decider which Na Magha won against a severely weakened Coleraine team. The first half was a story of Coleraine efficiency against Na Magha wastefulness as the Eoghan Rua took a commanding 2-04 to 0-3 lead into the half time lead, albeit with the breeze. And Sean McGoldrick's side were good value for that lead against a Na Magha team who were uncharacteristically lethargic. Coleraine constantly sought to isolate Colm McGoldrick inside with Sean Leo just in behind and it was a tactic that worked well in the opening half. At the other end, the swirling wind made life difficult for Na Magha's main source of scores - Foley. Six times the normally reliable Na Magha forward sent first half efforts wide while also seeing one effort strike the upright in conditions which made long range shooting precarious. It took only 13 seconds for Joseph McQuillan to get Coleraine on the scoreboard with Sean Leo McGoldrick doubling the advantage on three minutes. A decent start turned into a great start for Coleraine on nine minutes when Colm McGoldrick - again isolated inside - held off Conor McGoran before finishing low under Barry Robinson for his side's opening goal. Sean Leo McGoldrick added another point for a 1-03 to no score lead with Na Mgha not getting on to the scoreboard until the 13th minute when Foley split the posts from a free. Ciaran McGoldrick and Foley swapped scores before a second Coleraine goal put Eoghan Rua firmly in the driving seat. Colm McGoldrick was the creator, his hand pass picking out the run across goal of Niall Holly and his fierce finish to the net put Coleraine 2-04 to 0-3 up. A late Foley free brought that back by one but even with the win to come after the interval, it looked a tall second half order for Na Magha. When Niall Holly extended the Coleraine lead upon the restart, Na Magha fans must have been fearing the worst but that would be the Eoghan Rua's last score for 28 minutes. In between that time, Na Magha set about bridging the gap with a performance full of the intensity that had been missing at times in the opening half. Foley (free), Diarmuid Shiels and Timothy Rankin all hit points inside the opening 10 minutes and the city side were only denied a goal by two superb defensive blocks from Barry McGoldrick and Pearse Dallas, the latter stopping Thomas Gallagher's goal bound shot on the line with the keeper beaten. Foley added another three points, two from frees and one a superb individual effort to bring the deficit back to two and when Breandan Quigley's high pass was dispatched over the bar by Gallagher, there was only one in it with nine minutes to play. Both sides hit wides as the clock ticked nervously toward its finale but when Niall Holly was fouled and scored the subsequent free, it looked game over for Na Magha with two minutes left. It wasn't and that man Foley was the reason. First he fired over a great point before as, the clocked reached the end of two minutes of injury time, he scored the free that ensures both sides must do it all again. Na Magha: Barry Robinson, Jim McAdams, James McQuillan, Conor McGoran; Matthew Temple, Breandan Quigley, Mark McShane; Feargal McAnaney, Blaine Glass; Tim Rankin, Niall McCallion, Deaglan Foley; Thomas Gallagher, Diarmuid Shiels, Mark McCloskey. 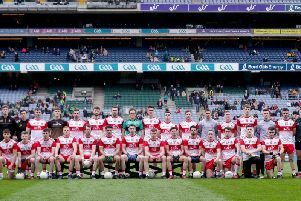 Eoghan Rua: Kevin McCarry, Colm McGoldrick, Sean Leo McGoldrick, Liam McGoldrick; Ciaran McGoldrick, Barry McGoldrick, Niall Holly; Ciaran Lenehan, Thomas Magee; Ciaran Lagan Pearse Dallas, Aidan Boyle; Joseph McQuillan, Michael McQuillan, Paul Roantree.